“An examination of alcohol industry efforts to self-regulate, whether it be in the area of alcohol advertising or health warning labels highlights how the alcohol industry is unwilling and ultimately unable to place the interests of the Australian public ahead of its shareholders and the pursuit of profit. The DrinkWise campaign is a textbook example of just how reckless and negligent the alcohol industry is prepared to be, stepping into an area ordinarily the responsibility of government, solely in an effort to stave off the threat of responsible and effective regulation. Implementation of the draft strategy requires investment in ACCHOs for the expansion of early intervention, prevention and alcohol treatment services and co-occurring mental health, social and emotional wellbeing services. As the established leaders in Aboriginal primary health care service delivery, ACCHOs must be the preferred providers for alcohol harm reduction services and programs for Aboriginal people. NACCHO recognises that certain regulatory measures, when implemented through genuine planning and consultation with Aboriginal communities, can be effective strategies for reducing alcohol harms. Notwithstanding this, NACCHO asserts that genuine consultation with ACCHOs, Aboriginal people and communities is imperative to ensure the draft strategy actions are culturally secure, sustainable and effective. Moreover, investment is required in ACCHOs to plan and establish complementary health and treatment approaches, and therapeutic jurisprudence diversionary programs. use of electronic screening tools – feasibility, validated for Aboriginal populations. NACCHO recommends that the Commonwealth engage in genuine and meaningful dialogue with NACCHO, ACCHOs, Aboriginal people and communities before progressing further with the draft strategy implementation. In this way the future risks posed by the draft strategy can be addressed, and further disadvantage and criminalisation of Aboriginal peoples and communities can be avoided. We welcome the opportunity to discuss this submission in further detail. 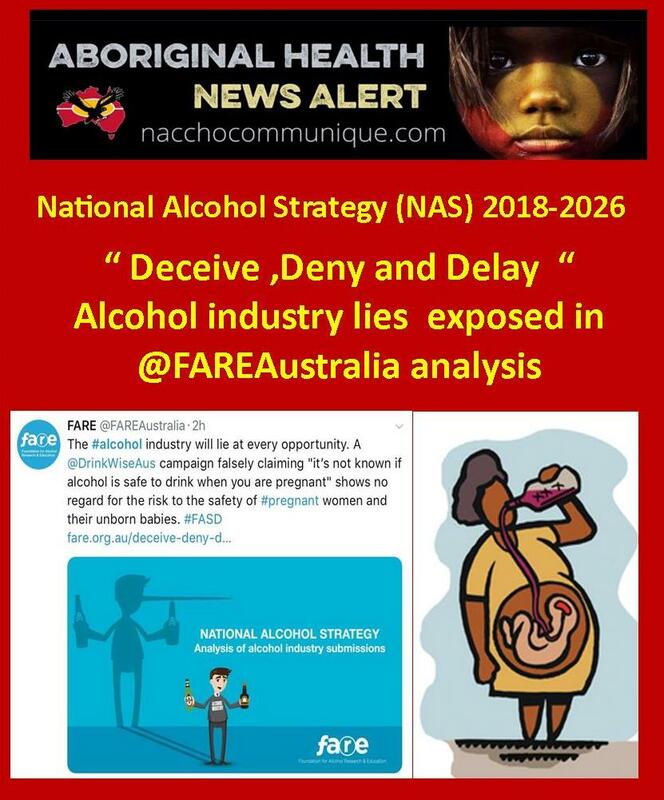 A newly released analysis of alcohol industry submissions to the National Alcohol Strategy (NAS) consultation has exposed the lengths the alcohol industry will go to attack, undermine and subvert the development of alcohol policy measures that would reduce harm and save lives. 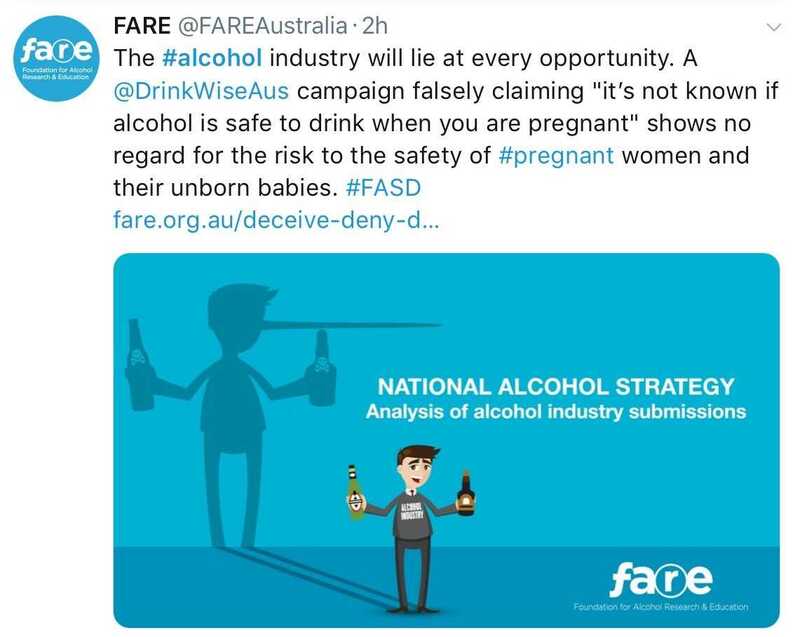 Its release follows the discovery, criticism and subsequent withdrawal of a misleading and inaccurate alcohol and pregnancy health campaign, which was developed by the alcohol industry front organisation, DrinkWise, for distribution to doctors surgeries nationally. The industry analysis by leading public health organisation, the Foundation for Alcohol Research and Education (FARE), and the discovery of the flawed DrinkWise campaign come as the Government prepares for the National Alcohol Strategy (NAS) Roundtable on Tuesday, and highlight the risks and very real danger of giving the industry a seat at the table. 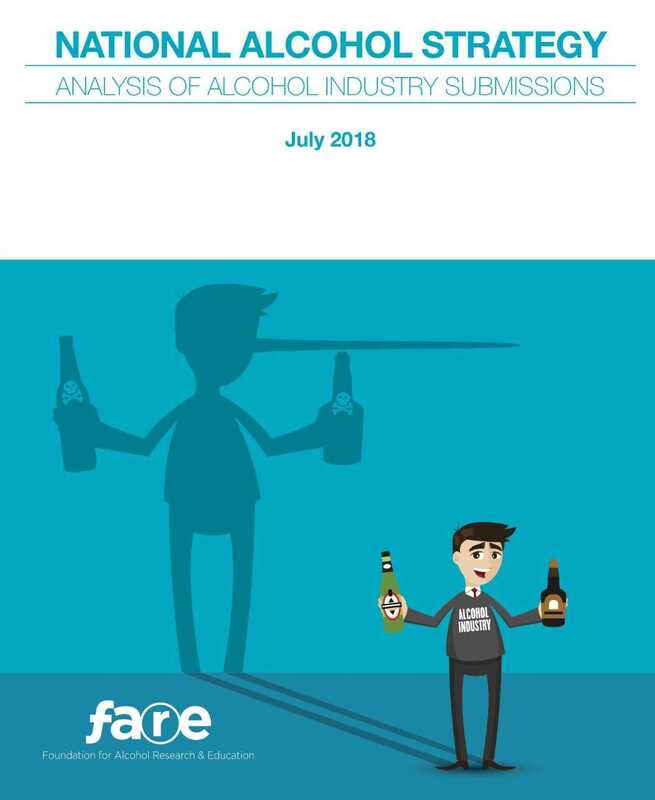 Analysis of the 17 alcohol industry submissions to the NAS consultation revealed four prominent and problematic claims by industry; none of which stand up to scrutiny when examined against the evidence base. FARE Chief Executive Michael Thorn says the examination of the 17 industry submissions including those from the Australian Hotels Association, Alcohol Beverages Australia, DrinkWise, Winemakers’ Federation of Australia, and Brewers Association of Australia reveal in their consistency a high level of coordination and a common willingness to deceive the public, deny the evidence and further delay the advancement of life-saving alcohol policy reform. “Australia has been without a National Alcohol Strategy since 2011, yet the alcohol industry is causing further delay and falsely claiming that the evidence base is inadequate. This is an industry that is even prepared to lie about its own credentials with DrinkWise, the alcohol industry front organisation, falsely claiming that “DrinkWise is not an industry body”. Mr Thorn says it is critical that the alcohol industry’s attempts to deceive and mislead the Australian public do not go unchallenged. Nor do the alcohol industry’s claims to be a willing collaborator in implementing awareness and prevention messages stand up to scrutiny. Mr Thorn says that by any measure the industry’s voluntary labelling scheme has been an abject failure with fewer than half of all packaged alcoholic beverages available for sale displaying some type of pregnancy warning label.